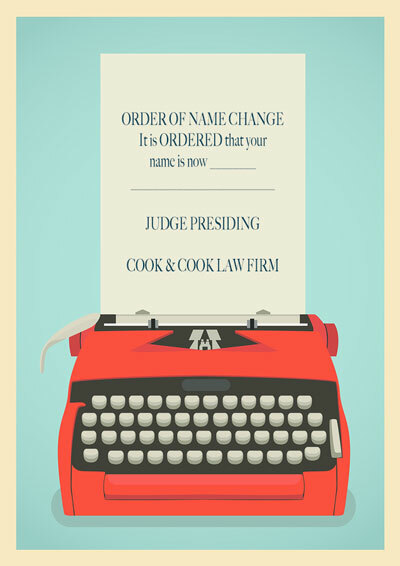 The Cook & Cook Law Firm can assist you with changing your name, or your child’s name. If the name change in San Antonio is for a child, we must simply tell the court the reason for the change of name and confirm that the child lives in Bexar County. If the name change is for an adult, a set of fingerprints are necessary, as well as a confirmation that the adult is not a convicted felon. What Are Some Accepted Reasons For Getting a Named Changed in Texas? How Long Does it Take to Get a Name Changed in Bexar County? How Much Does it Cost to Get My Name Changed in San Antonio? If the name change is for an adult, the Cook & Cook Law Firm charges $527 in legal fees. The client will also need to pay the governmental filing fees of $272 ($799 total). If the name change is for a child, then, so long as all legal guardians of the child are willing to sign off on the order changing the child’s name, the same fees of $527 and filing fees of $272 will apply. Children will not need to do fingerprint cards. If the name change is for a minor and any guardian/parent of the minor is unwilling to sign an order granting the name change, the Cook & Cook Law Firm charges $1,000 as a retainer payment, which is billed at $275 per hour. The variance in the price is simply due to the fact that without the consent of all guardians, the lawsuit is a contested matter that will require a hearing, and preparation for the name change hearing. (5) whether the child is subject to the registration requirements of Chapter 62, Code of Criminal Procedure. Sec. 45.101. WHO MAY FILE; VENUE. An adult may file a petition requesting a change of name in the county of the adult’s place of residence. (6) a legible and complete set of the petitioner’s fingerprints on a fingerprint card format acceptable to the Department of Public Safety and the Federal Bureau of Investigation. Sec. 45.103. ORDER. (a) The court shall order a change of name under this subchapter for a person other than a person with a final felony conviction or a person subject to the registration requirements of Chapter 62, Code of Criminal Procedure, if the change is in the interest or to the benefit of the petitioner and in the interest of the public. (c) A court may order a change of name under this subchapter for a person subject to the registration requirements of Chapter 62, Code of Criminal Procedure, if, in addition to the requirements of Subsection (a), the person provides the court with proof that the person has notified the appropriate local law enforcement authority of the proposed name change. In this subsection, “local law enforcement authority” has the meaning assigned by Article 62.001, Code of Criminal Procedure.